My little birdies are lucky enough to get two! 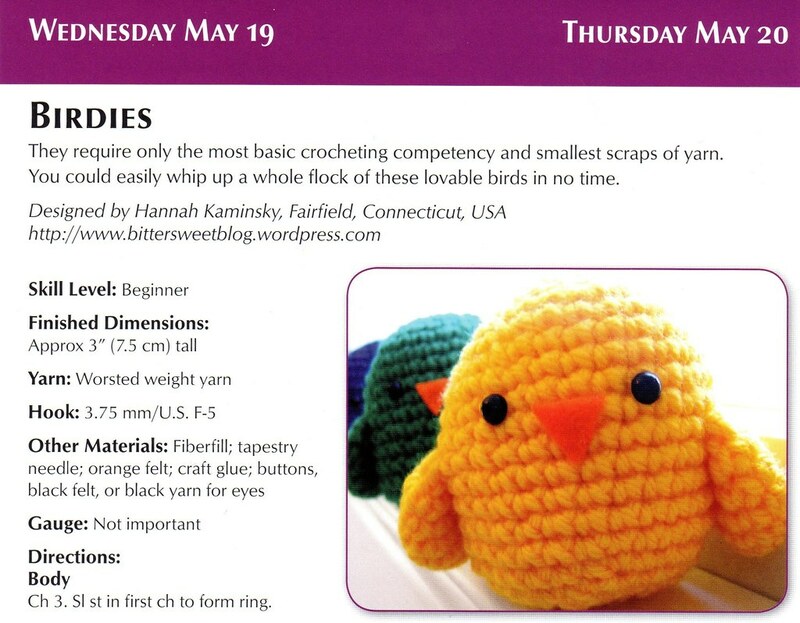 As much as I’ve already been enjoying the 2010 Crochet a Day Calendar, I’ve got to say, it gained about a hundred extra awesome points this morning when I revealed the latest page, and remembered that my work has been included this year. 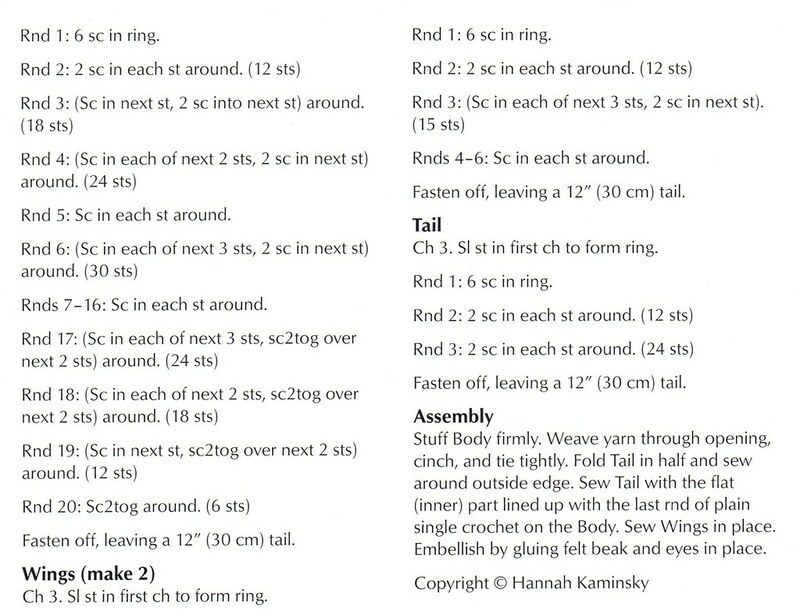 Though it’s one of my oldest patterns, those simple feathered friends of mine continue to be one of the most popular patterns on the blog, and I’m so happy that they could get another moment in the spotlight. An extra little bonus of this whole deal is that now everyone gets a lovely little printable pattern card, to print and cherish, to have and to hold… Er, well, at least to enjoy and share around, at least! Just click the pictures above for a full view. Although I personally believe that every day should be Earth Day, marking it on the calendar does give us a particularly good excuse to duck out of work early and enjoy the outdoors. Especially on this beautiful sunny day today, it would be downright foolish to hunker down inside. Spring is out in full force at last, showing off a rainbow of colors with its fresh blooms and sprouts. The tiny young fawns with white-speckled coats have emerged as well, one of my favorite sights to behold; a bit awkward and shaky on their legs still, but somehow incredibly elegant all the same. They may grow up to threaten the existence of my vegetable garden, but for now, I don’t mind sharing some of the little purple flowers sprinkled across the lawn. Munching away without a care in the world, this little one is clearly enjoying the nice weather and springtime bounty of greenery, too. Like mom always said, you’ve got to eat your veggies if you want to grow up big and strong. There’s plenty of scientific evidence to back that claim up now, but even before the medical experts decided to weigh in and add legitimacy to that classic parental insistence, it was an unarguable fact that those leafy greens were the key to a healthy adulthood. Instead of reaching for the spinach like so many trendy mothers, however, mine would bust out the most unsuspecting subjects… Like mushrooms. Balking at the power of a simple button mushroom, I resisted just like any average child, squirming in my seat until dinner time was over and I could toss out the offending fungus on my plate. Clearly, my mom had a few tricks up her sleeve, and over time I caught wind that these were no average mushrooms at all. Sure, they looked different than their brown brethren, but when I would finally oblige with a few tentative bites, it felt as though my energy levels suddenly went through the roof, like a new set of batteries had been installed inside me. It’s a crazy concept to be sure, but I’m convinced to this day that those mushrooms and veggies were what always charged me back up, almost like magic! Of course, I still could never bring myself to eat those suspicious red-capped ‘shrooms… Perhaps that’s why I never grew so tall!